The quarry is situated in the Randfontein District, on the R 500 between Carletonville and Randfontein. 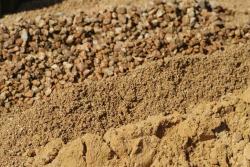 We are fortunate that the farm on which we are situated and its surroundings has a good supply of Decomposed Granite. Decomposed Granite, also known as DG, is granitic rock that has weathered to the point that it readily fractures into smaller pieces or chunks of weak rock. Further weathering produces rock that easily crumbles into mixtures of gravel, sand, and silt-sized particles with some clay. Granite is composed of plagioclase feldspar, orthoclase feldspar, quartz, mica and possibly other minerals. The chemical transformation of Feldspar, one of the primary constituents of granite, into the clay mineral kaolin is one of the important weathering processes. The presence of clay allows water to seep in an further weaken the parent rock allowing it to fracture or crumble into smaller particles. Grains of silica in the granite are relatively resistant to weathering and may remain almost unaltered.